This refill is a cartridge for the original dispenser of Brush ON Block® mineral sunscreen. A revolutionary mineral sunscreen in powder form with SPF 30 broad spectrum sun protection from UVA, UVB, and IRA rays, the mess-free formulation is suitable to be used over or under any makeup application. Brush ON Block® has a non-chemical formulation that does not clog up pores with zero irritation or skin reactions. Free from paraben, PABA, phthalate and oxybenzone. 1. Remove the bottom cartridge by holding the top of the brush with one hand and the bottom of the brush with the other. 2. Twist the bottom cartridge to the left until it unscrews and comes off. 3. Remove the lid from the refill cartridge and screw the cartridge on the bottom of the brush, twisting to the right. Titanium Dioxide 15% & Zinc Oxide 12%, Alumina, Boron Nitride, Chamomile Flower Extract, Green Tea Extract, Honeysuckle Flower Extract, Iron Oxides, Mica, Rice Lipids, Rice Starch, Safflower Oil, Silica, Stearic Acid, Triethoxycaprylsilane. Beware of unauthorized/imitation products sold online. PNC Holdings Sdn. Bhd. 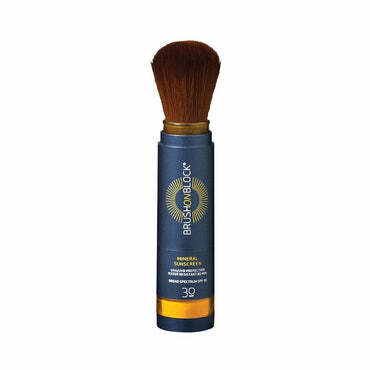 is the Official Sole Distributor for Brush ON Block® Mineral Sunscreen in Malaysia. We have not appointed any other online distributors for this product. If you have any doubts or questions about the authenticity of the product sold online, please do not hesitate to contact us at 03-7727 2260 or send us an email at customerservice@kissmineral.com.